A gold sword hilt plate. Plain design, two rivets present at one end. A gold sword Hilt plate, garnets set within filigree rings at ends, one rivet still present. 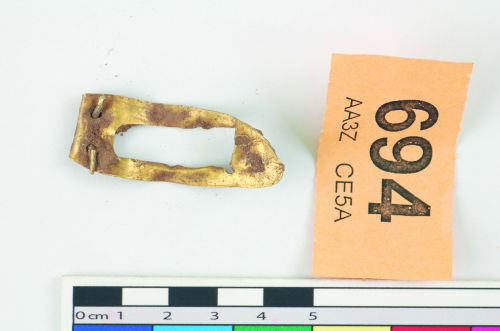 Fragment of a sword hilt plate, gold, dirty. Rivet at one end, dome headed with a filigree surround. Rivet pin present. A gold sword hilt plate, plain. Badly mangled, remains of one rivet still in place.